The mid part of tonight I played too much old stuff. Even though it was all requests, I should have taken a few more chances and played more new tunes. Still, I managed to fit in brand-new tracks by Kite-Eating Tree and The Elected. Overall, I think it was a cool night. One bloke seemed insanely happy I played ‘Driver 8’ for him, he nearly fell off the stage. Tonight’s best new track was, for the second week running, a track from the marvellous new The Elected album, this time it was ‘Go On.’ Yum. Go out and buy it NOW! I asked Malcy Reveal and I can’t believe it hasn’t sold loads. They need to get some “bloke from Rilo Kiley”-type stickers on it. The best old track was Adhemard’s ‘Don Daine La Ridaine.’ I wish I could find out more about this mad old French music but I’ve googled them and come up with nowt. Even Amazon.fr comes up empty. If anyone can find me more info, I’ll give you 50p. The pic at the top of the page is of the runner-up best old track. 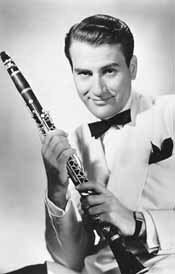 Bow down before the genius of Artie Shaw, mofos!